The Kettering Police Department now provides an online tool that allows users to access crime data for the Kettering community. 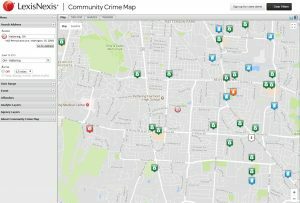 Provided in partnership with LexisNexis Risk Solutions, the Community Crime Map updates weekly with new data from the Kettering Police Department records system. The Community Crime Map shows crimes in your area and allows you to sign up to receive crime alerts and neighborhood watch email reports of recent crimes in your neighborhood from the Kettering Police Department. Getting information about crime data in your neighborhood is easy.